Layered Chicken Enchilada Casserole has the ingredients of this Mexican favorite stacked to serve in slices like pie. Easy assembly and hands-off cook time make it a perfect dish for easy entertaining or busy nights. You’d never know that this Chicken Enchilada Casserole was in the freezer, waiting to be enjoyed, for almost a month! But, that’s just where it was…until I needed a night off from dinner! Then, I pulled it out, baked it, and felt like I was being treated to a night out. There is literally no work involved at that point. It’s part of our collection of Make and Freeze recipes that do not disappoint. It’s an easy prep dinner (about 10-15 minutes) and the rest is hands-off bake time. And that last point just happens to make it perfect for entertaining too! 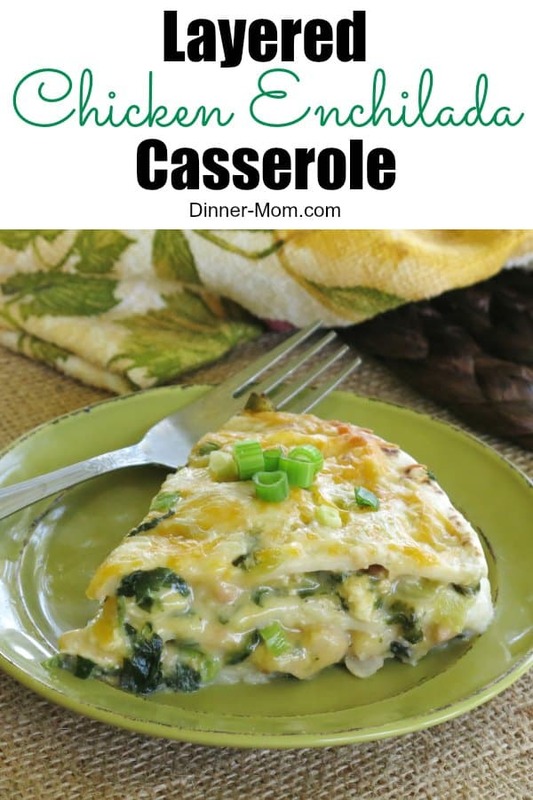 This is another tried and true favorite from our Make Ahead Meal Kitchen. It’s the same concept as Stacked Burrito Pie Casserole, but with a different flavor profile. To make this easy recipe, place a flour tortillas in a cake pan and layer with a creamy enchilada sauce, chicken, Great Northern beans and lots of cheese! We made 3 layers and used 2 flour tortillas. You’ll need diced cooked chicken to make this. Use leftovers or try this Baked Lemon Pepper Chicken recipe. Use a knife or kitchen scissors to cut the chicken into cubes. See more tips below. Or, hop down for a quick video just before the recipe instructions. The secret is in the sauce or so they say! We healthified it by swapping Greek Yogurt for sour cream and adding a healthy dose of…wait for it…spinach. Yep! If you’re a spinach lover, you’ll be in heaven. But, you really can’t tell what the green stuff is. But, you do enjoy the benefits of eating, at least a little bit of this powerhouse vegetable. More swaps to consider: Whole wheat for regular flour tortillas or less cheese…just, not at my house! To keep it vegetarian add more beans or tofu in place of the chicken. Once all the ingredients are out for this recipe…make two (or more) for later. It freezes beautifully. I made the one picture about 3 weeks ago. Assemble the ingredients in an 8-9 inch round or square pan. Or, use a cake pan lined with aluminum foil. Start the freezing process in the cake pan. After a few hours when the pie has firmed up, remove the foil from the pan and store it in the freezer. When you are ready to defrost, return it to the cake pan that you will use to cook it in. Easy peasy. By the way, this pairs nicely with a side salad. Don’t forget the chips and simple guacamole dip! Chicken Enchilada Casserole layers the ingredients of this Tex-Mex favorite so it can be served in slices like a pie. Easy assembly and hands-off cook time make it a perfect dish for easy entertaining. Combine yogurt, milk, cumin and green chilies in a small bowl. Remove a quarter cup on the combined mixture and set aside. Add spinach and chicken to mixture and stir to combine. Spread half of the chicken mixture (about 3/4 cup) over the tortilla. 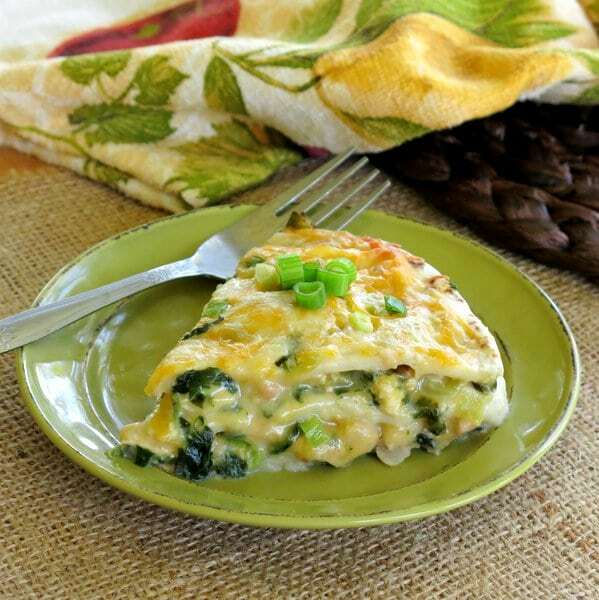 Layer over the chicken mixture: half of the Great Northern beans, 1/2 cup shredded cheese and 2 Tablespoons of green onion. Place a flour tortilla on top and repeat steps 6 and 7. Place a flour tortilla on top. Spread remaining yogurt mixture and ½ cup shredded cheese on top. Remove foil and bake for 10 minutes more or until cheese is melted. Allow pie to set for about 5 minutes before serving. To make ahead and freeze, assemble recipe through step 11. Wrap and store in the freezer for up to two months. When you are ready to enjoy it, defrost in refrigerator for approx. 24 hours and then cook according to directions. Assembled pie can be cooked from frozen. Use meat thermometer and cook until internal temperature reaches 145 degrees F. Cooking from frozen may double the cook time. This pie looks fantastic with all its melty goodness! That really does look beautiful. I love all the greens in there! How cool that it’s lighter with a sauce made with Greek yogurt! I think this is a fun and flavorful week night dinner idea, Marjorie!! I absolutely love meals like this that I can stock my freezer with! This looks so cheesy and delicious. I love that you can assemble it early in the day and then bake it off for dinner. Sure is a help on busy days! Those are the best kind of dinners to have on hand! Looks great! You seriously can’t beat home cooked freezer meals!! Such a treat!! 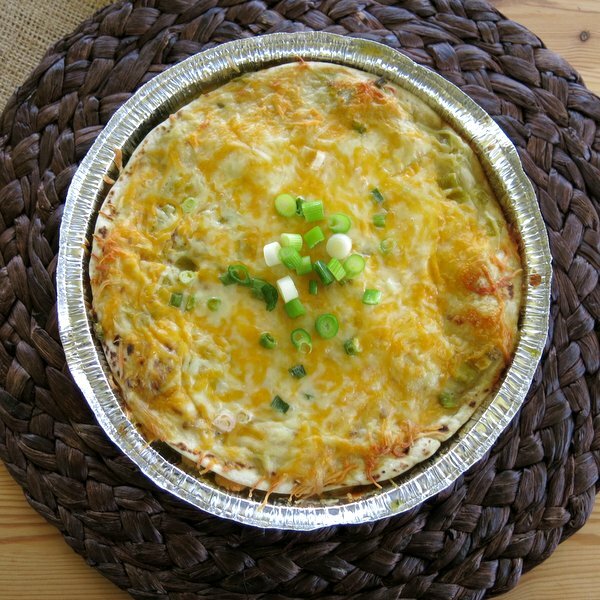 This enchilada pie looks terrific – look at all the cheese… mmmm!!! 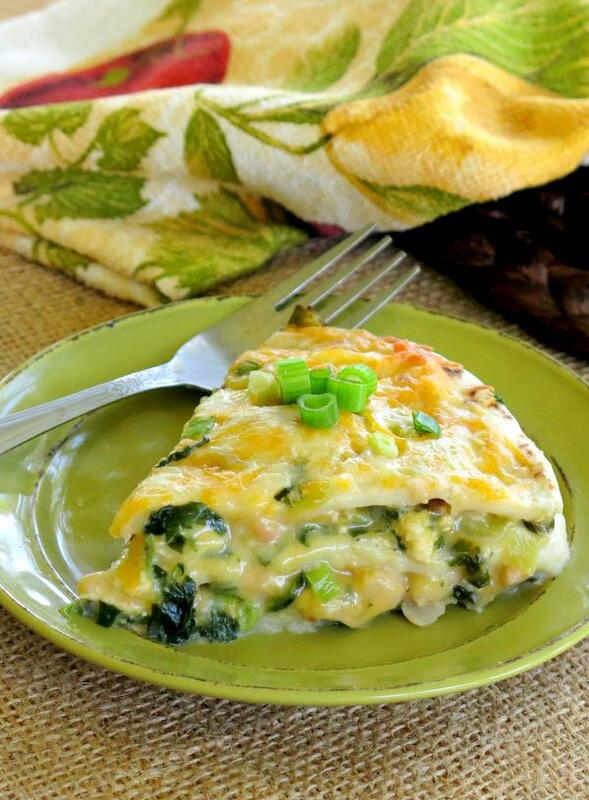 I’m a huge lover of spinach so I would be all over this dish! Heck yeah! I LOVE Chicken Enchiladas…love how easy this is! Now that’s just better than a lasagna, if I may say so! And I would have never guessed that frozen enchiladas would reheat so well! I haven’t made enchiladas in years, but this pie looks like something I need to make pronto! Love the way you assembled it in this form instead of rolling them up. I love make ahead and freeze dinners! They are so much better than take out on those nights I don’t want to cook. And that casserole looks so good! I’ve been thinking that I need more freezer meals in my back pocket. This looks like one we’ll love!